06/28/05 photos taken by Alex Nitzman & Carter Buchanan. 08/04/07 photos taken by AARoads. Special thanks goes to Jack Thomas for help with photo captions. Leaving the intersection with Tibbits Avenue near Green Island on New York 787 south. Photo taken 08/04/07. 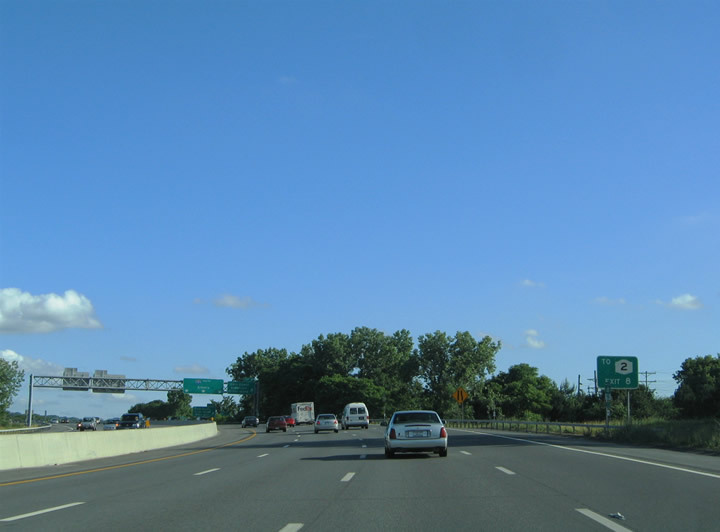 New York 787 (Cohoes Boulevard) southbound on the approach to Interstate 787 and New York 7. A directional-cloverleaf interchange provides the movements between the two highways ahead. Cohoes Boulevard extends north from Interstate 787 into downtown Cohoes as a four-lane divided highway. Photo taken 08/04/07. 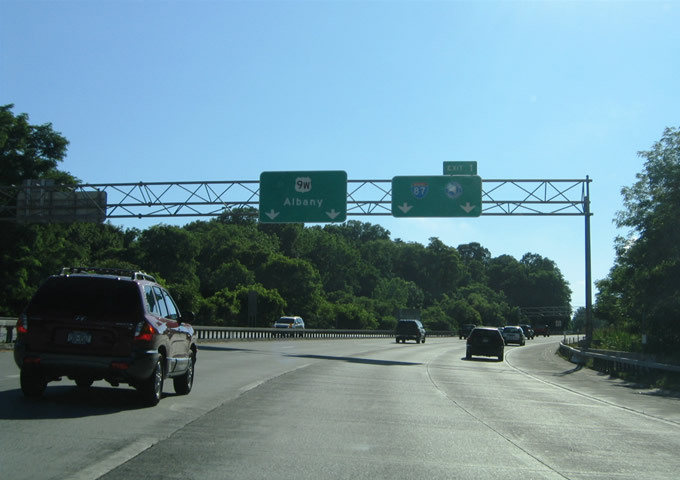 Exit 9W carries southbound motorists onto New York 7 westbound to Interstate 87 (Adirondack Northway). 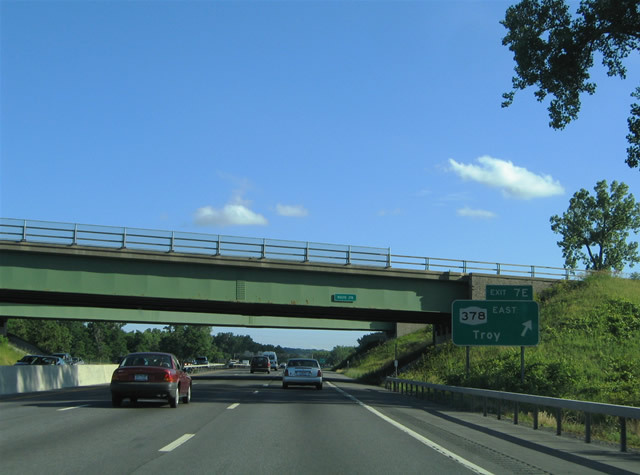 New York 7 constitutes an east-west freeway between the city of Troy and the Adirondack Northway. Photo taken 08/04/07. Traffic interests to Troy and Bennington, Vermont depart New York 787 southbound via the Exit 9E loop ramp to New York 7 east. New York 7 crosses the Collar City Bridge over the Hudson River between Interstate 787 and 6th Avenue in Troy. Photo taken 06/28/05. New York 7 travels east from Troy and transitions to Vermont 9 on the 30-mile drive to the city of Bennington, Vermont. The freeway portion of New York 7 was originally planned to be an extension of Interstate 88 to Portsmouth, New Hampshire. Photo taken 06/28/05. 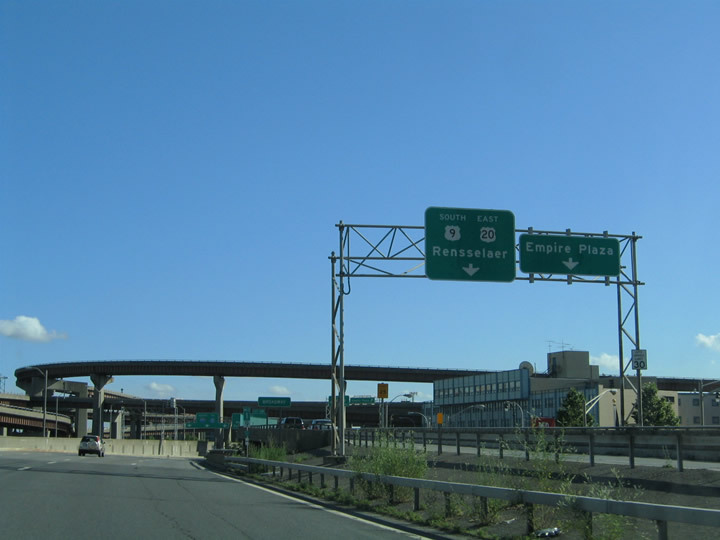 The Interstate 787 freeway begins as New York 787 ends. Travelers next encounter the Exit 8 diamond-interchange with 23rd Street in the city of Watervliet Photo taken 06/28/05. 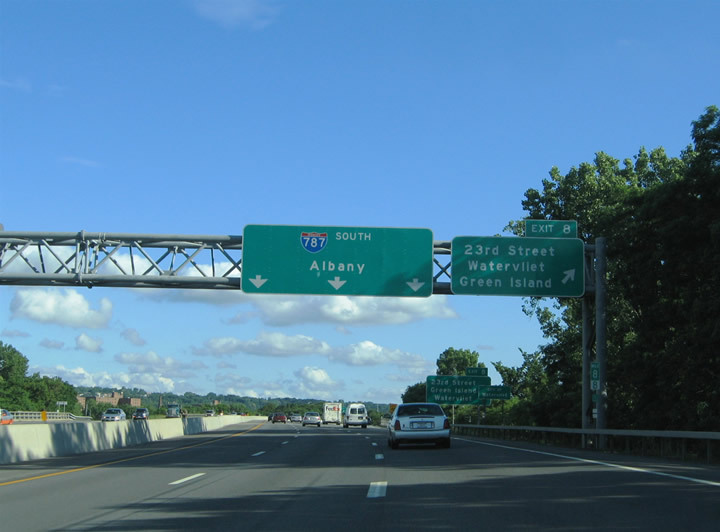 Exit 8 provides connections to New York 2 (19th Street) and the Troy-Green Island Bridge. New York 2 travels east-west between Latham and Troy and motorists bound for the route can access it via 23rd Street west to New York 32 (Broadway) southbound. Photo taken 06/28/05. 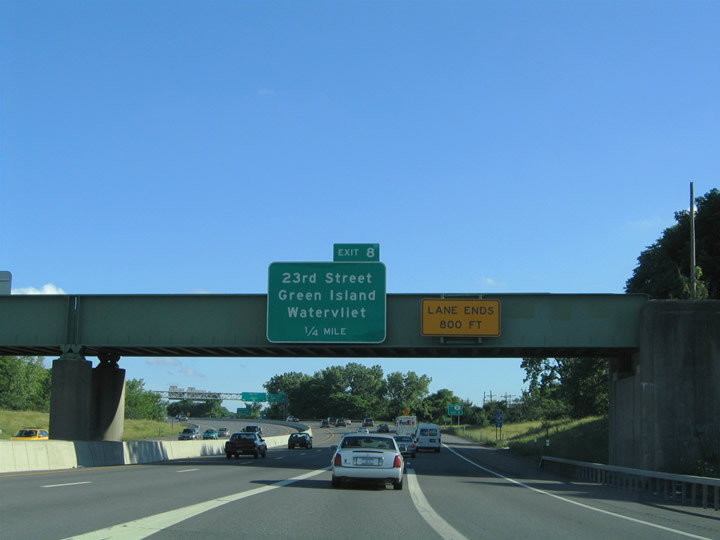 Interstate 787 southbound at the Exit 8 off-ramp to 23rd Street and Watervliet. 23rd Street transitions to Lower Hudson Avenue east of the freeway en route to the Albany Avenue and the Troy-Green Island Bridge. The pull-through freeway for the mainline features Albany. 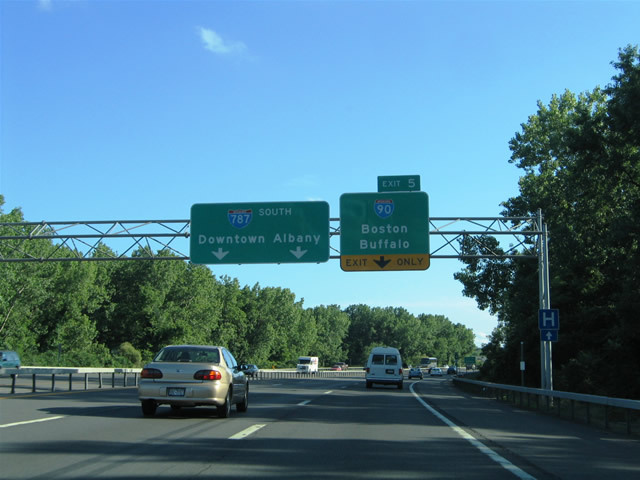 Technically, the freeway is already in Albany, since Troy, Watervliet, etc are suburbs of Albany (Saratoga and Schenectady also hold this title even though they are separate cities). They are all part of the Capital District, centered around Albany. Photo taken 06/28/05. The first southbound reassurance shield for Interstate 787 resides south of the 23rd Street on-ramp (Exit 8). Photo taken 06/28/05. Next in line for southbound travelers is the Exit 7 directional-cloverleaf interchange with New York 378 (Menands Road). New York 378 travels between south Troy and Menands. Photo taken 06/28/05. New York 378 (Menands Road) westbound travels 2.75 miles west to U.S. 9 (Loudon Road) and New York 152 (Old Niskayuna Road). 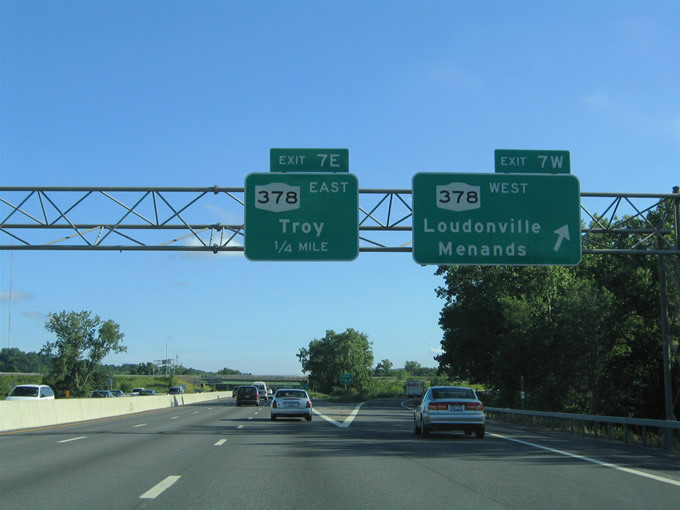 U.S. 9 travels north to Loudonville and south to Menands from the west end of New York 378. Photo taken 06/28/05. 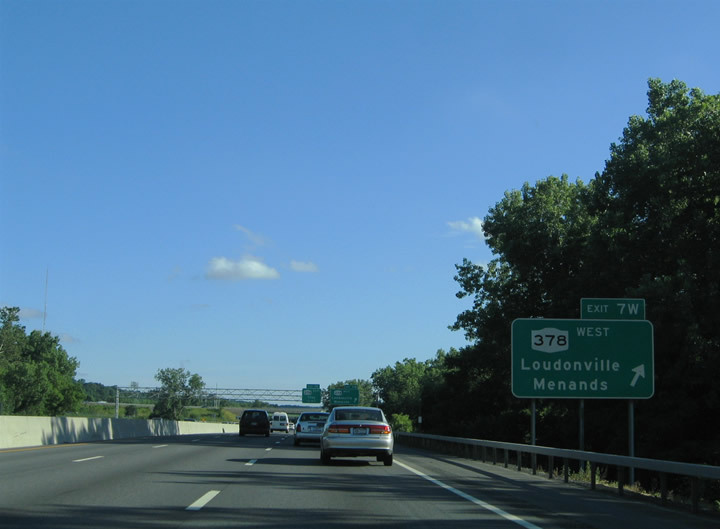 Interstate 787 southbound at the Exit 7W off-ramp to New York 378 (Menands Road) westbound. 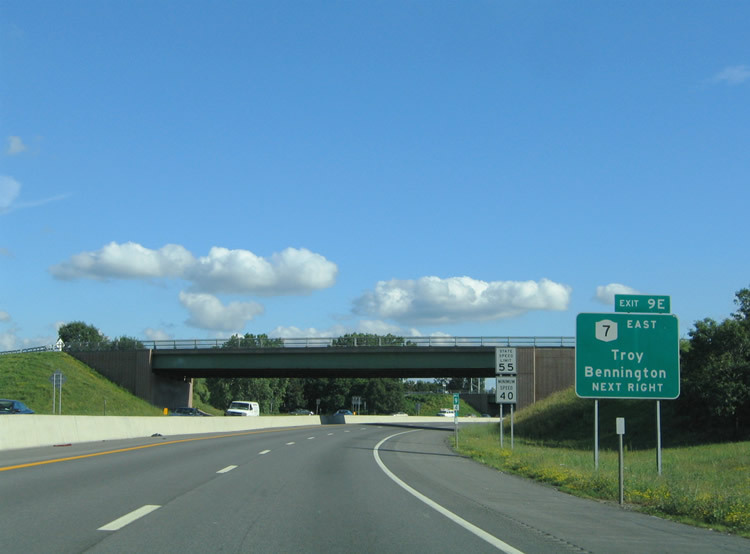 Guide signs posted at Exit 7 are older than the northbound signs, for the northbound signs have "Downtown Troy" as a control point instead of just "Troy". Photo taken 06/28/05. Southbound at the loop ramp onto New York 378 (High Street) eastbound into South Troy. New York 378 ends nearby at the junction with U.S. 4 (Mill Street and Burden Avenue). 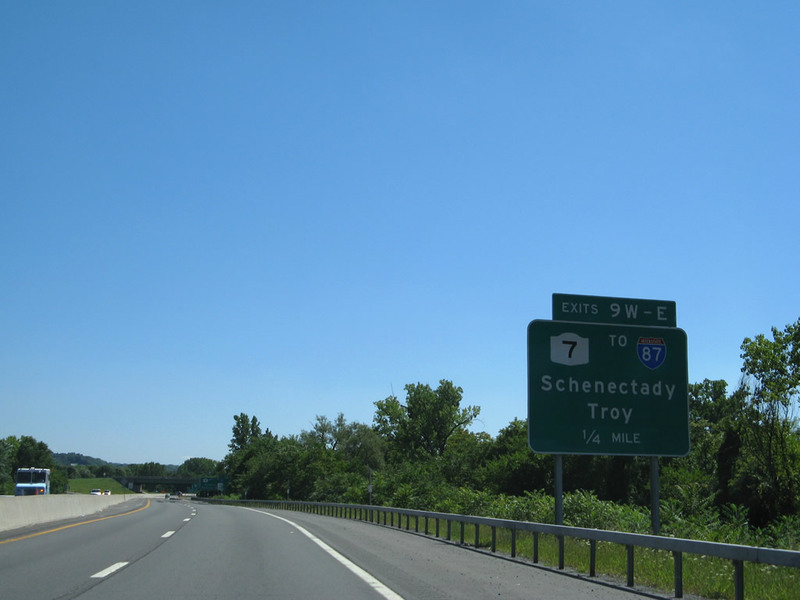 U.S. 4 travels south from South Troy to Defreestville and East Greenbush. Photo taken 06/28/05. 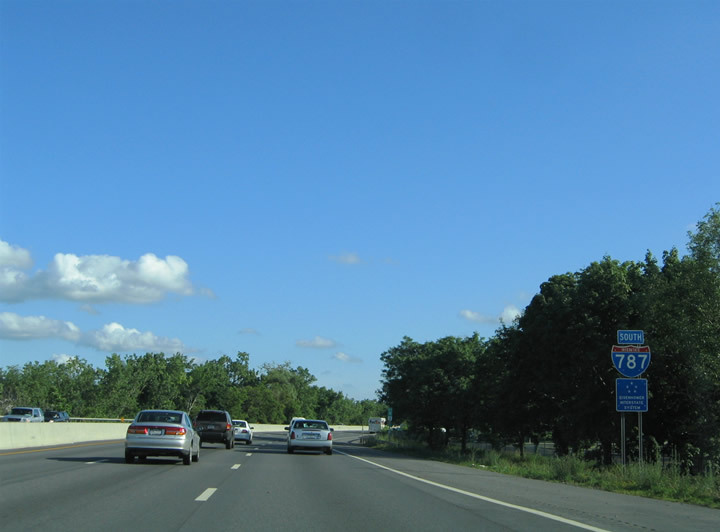 The Exit 7 on-ramp forms an auxiliary lane for Exit 6 (New York 32) on Interstate 787 south. New York 32 parallels Interstate 787 southward from Cohoes to the Port of Albany. Downtown Albany can be seen in the distance from here southward. Photo taken 06/28/05. Beyond the Exit 6 trumpet interchange with New York 32 is the one-mile overhead for Interstate 90 (Exit 5). Interstate 90 meets Interstate 787 northeast of downtown Albany between Rensselaer and Roessleville. 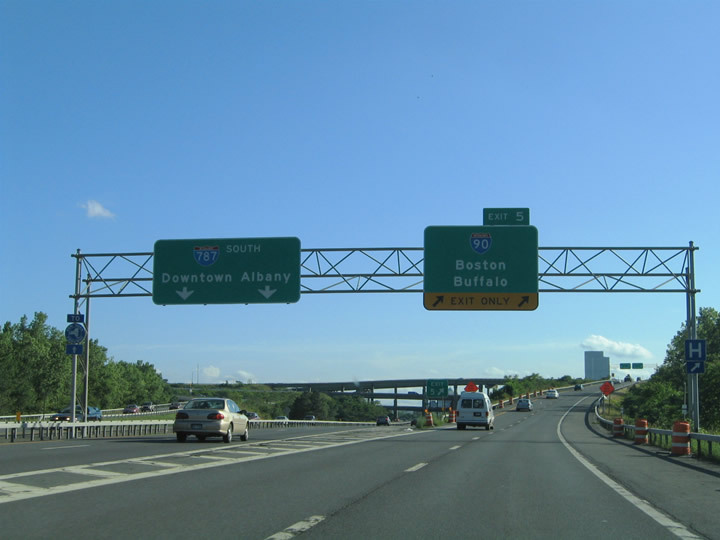 The east-west freeway diverges from the New York Thruway system through the eastern reaches of the Capital District. Photo taken 06/28/05. Interstate 787 narrows to four overall lanes through the four-level symmetrical-stack interchange with Interstate 90. The high-speed interchange resides west of the high-level Patroon Island Bridge of Interstate 90. 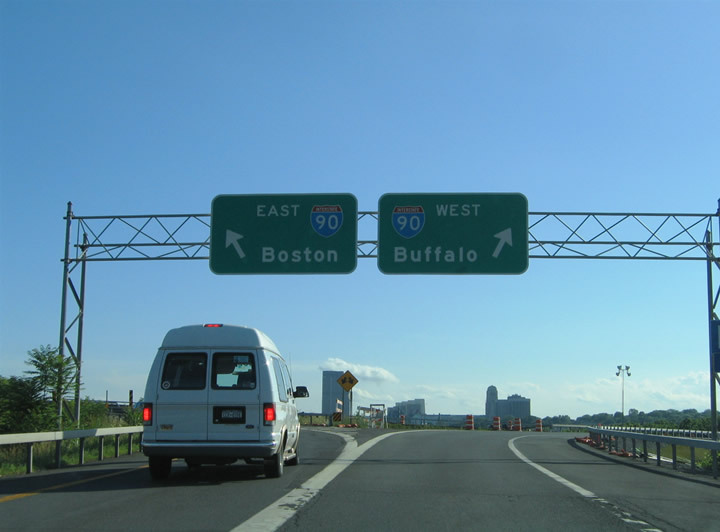 Interstate 90 provides the main route between Albany and Springfield, Worcester, and Boston Massachusetts to the east and Utica, Syracuse, Rochester, and Buffalo to the west. Photo taken 06/28/05. A two lane off-ramp ascends from the Interstate 787 southbound mainline for Interstate 90. Interstate 90 crosses the Patroon Island Bridge eastward en route to Rensselaer, East Greenbush, and East Chatham. 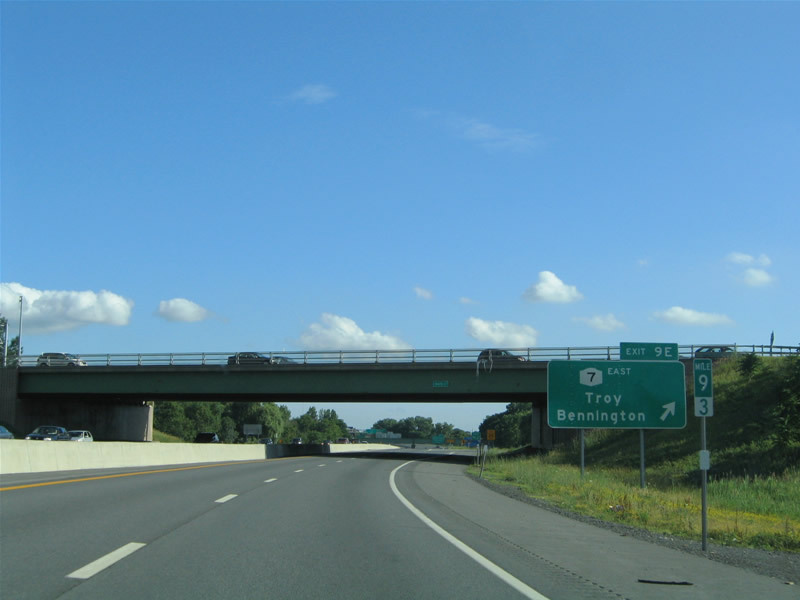 The freeway merges with the Berkshire Section of the New York Thruway in 14 miles. Photo taken 06/28/05. 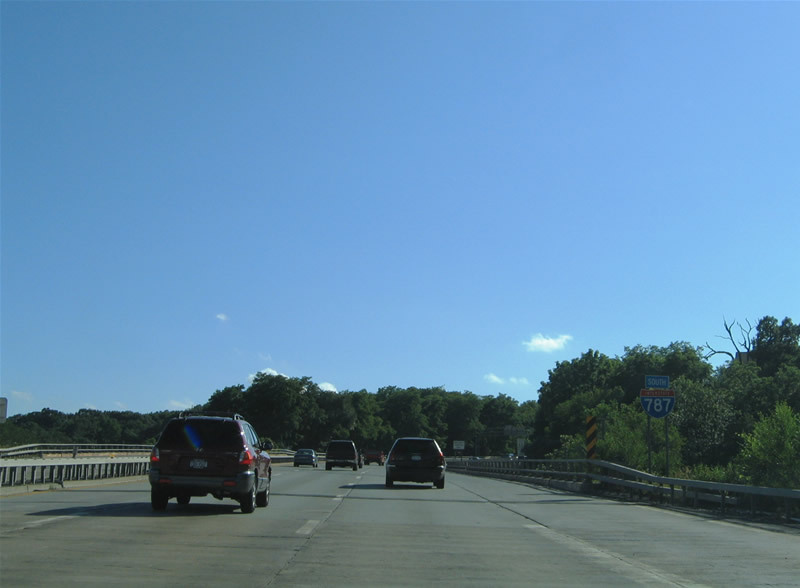 Single-lane ramps join Interstate 787 motorists with Interstate 90. Westbound travelers intersect a second four-level symmetrical stack interchange nearby at U.S. 9. 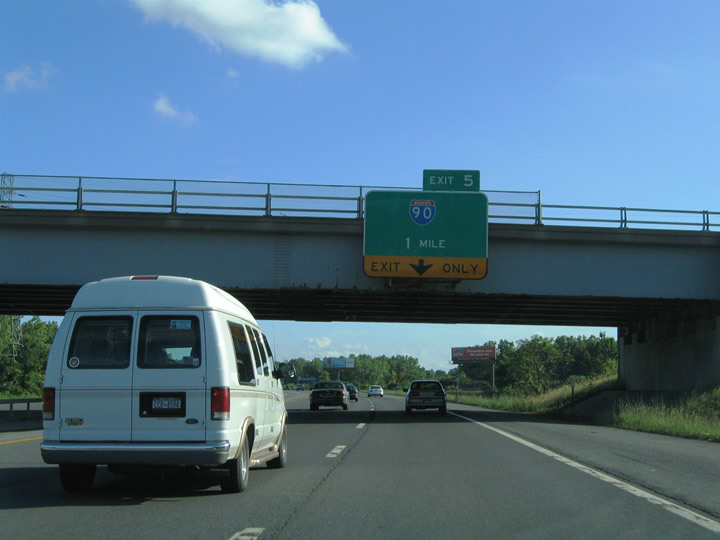 Interstate 90 otherwise continues seven miles to its merge with the New York Thruway mainline at Interstate 87 (Adirondack Northway). 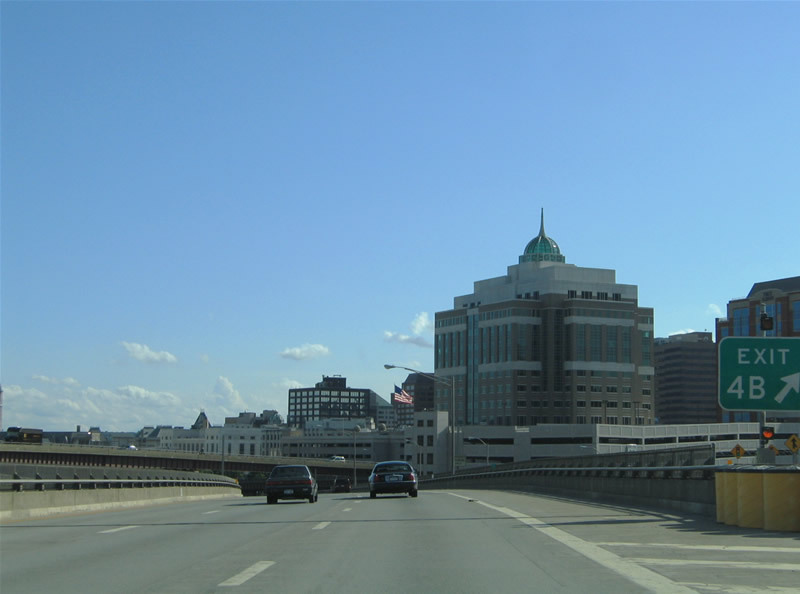 Interstate 90 serves the Capital District city of Schenectady in 12 miles at Interstate 890. Photo taken 06/28/05. 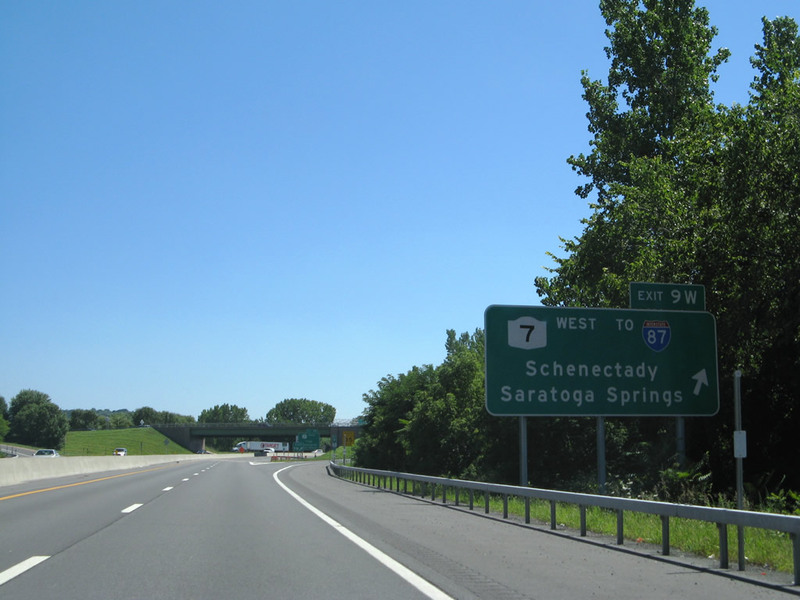 Interstate 787 continues southward into Albany proper beyond Interstate 90. Exit 4A departs the freeway next onto the parallel Water Street for connections to Columbia and Colonie Streets. Photo taken 06/28/05. Southbound reassurance marker posted between Interstate 90 (Exit 5) and the Water Street off-ramp (Exit 4A). Photo taken 06/28/05. Exit 4B leaves Interstate 787 southbound for Water Street southbound. 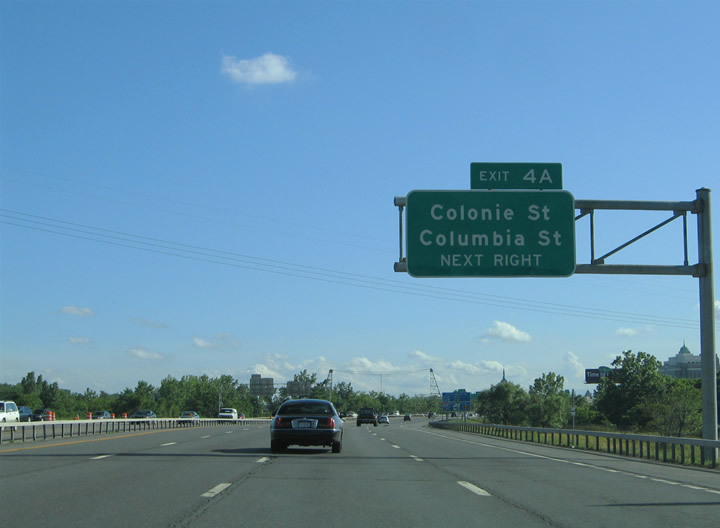 Water Street intersects Colonie Street nearby and Columbia Street south of the Exit 4A interchange with U.S. 9 (Clinton Avenue). U.S. 9 (Clinton Avenue) serves Albany's Arbor Hill neighborhood and downtown. Photo taken 06/28/05. 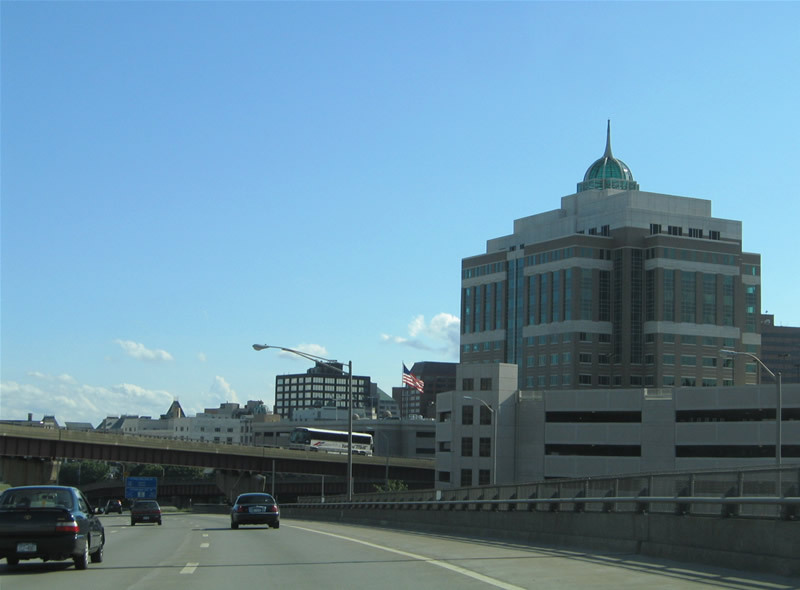 Interstate 787 makes its approach to downtown Albany as the a grand view of the skyline comes into view. The freeway undulates as it crosses and parallels railroad tracks. Photo taken 06/28/05. 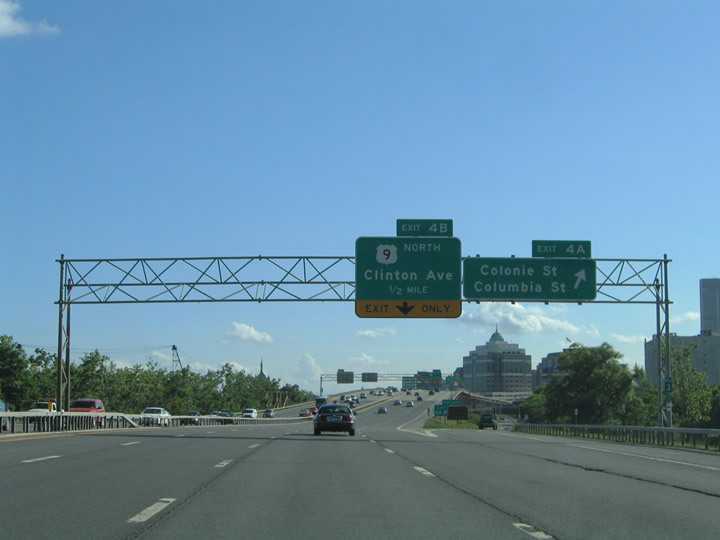 The first downtown area exit joins Interstate 787 southbound with U.S. 9 (Clinton Avenue) northbound. U.S. 9 follows Clinton Avenue east from Henry Johnson Boulevard to Interstate 787. 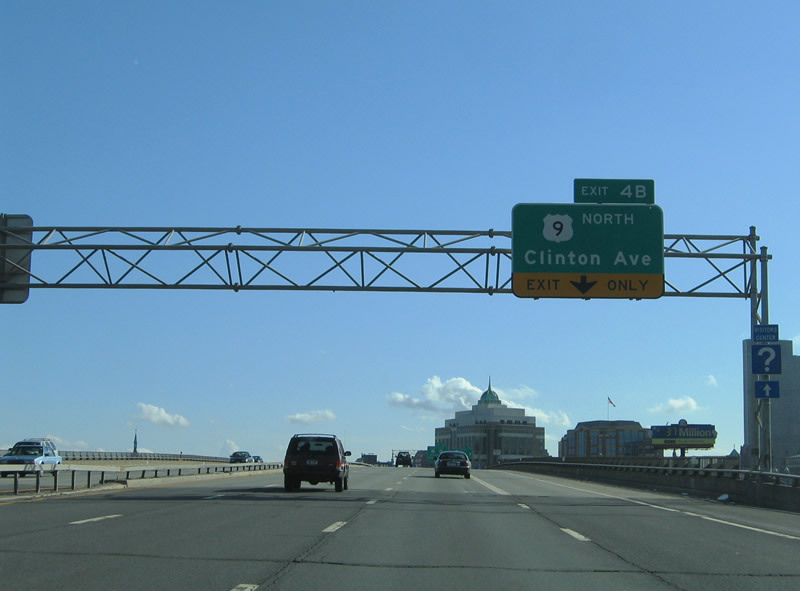 The US highway parallels the freeway between Clinton Avenue and the South Mall Expressway / Dunn Memorial Bridge as collector/distributor roadways for Interstate 787. Photo taken 06/28/05. Southbound at the Exit 4B off-ramp onto U.S. 9 (Clinton Avenue) northbound. A wye interchange provides the movements between the two roadways. U.S. 9 northbound travelers however cross over Interstate 787 between the northbound side c/d roadway and Clinton Avenue. Photo taken 06/28/05. Interstate 787 sinks toward the circle stack interchange with the South Mall Expressway. High rise buildings associated with downtown rise to the west of the freeway. Pictured here is the descent from Exit 4B and the NYSDEC headquarters. Photo taken 06/28/05. Another view of the NYSDEC headquarters ahead of the U.S. 9 northbound flyover ramp to Clinton Avenue. Photo taken 06/28/05. Southbound at the Hudson River Way pedestrian bridge linking the Corning Preserve to downtown. The span was constructed in 2002 to link the Hudson riverside park with the adjoining streets west of Interstate 787. Photo taken 06/28/05. 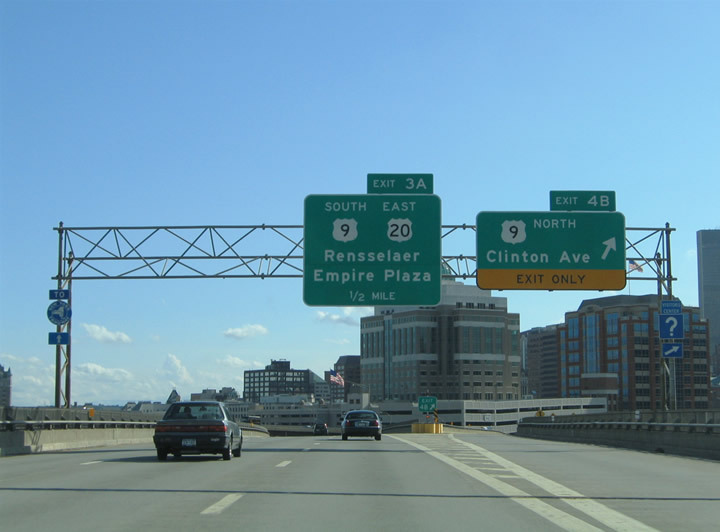 Exit 3A departs Interstate 787 southbound for the Dunn Memorial Bridge across the Hudson River to Rensselaer. U.S. 9 south & U.S. 20 eastbound merge at the South Mall Expressway interchange with Interstate 787. The tandem Advance overlap 8.5 miles southeast from downtown Albany to East Greenbush and Schodack Center. Pictured in the background of the Exit 3A gore point is the Suny Administration Building (formerly the D&H Railway Headquarters). The Interstate 787 median hold two tracks of the D&H railroad remnants between the northbound and southbound lanes. Before the freeway was built, railroad tracks ran throughout this area. Photo taken 06/28/05. Traffic on the parallel Water Street southbound may access the South Mall Expressway ramps from Interstate 787 beyond the Exit 3A gore point. 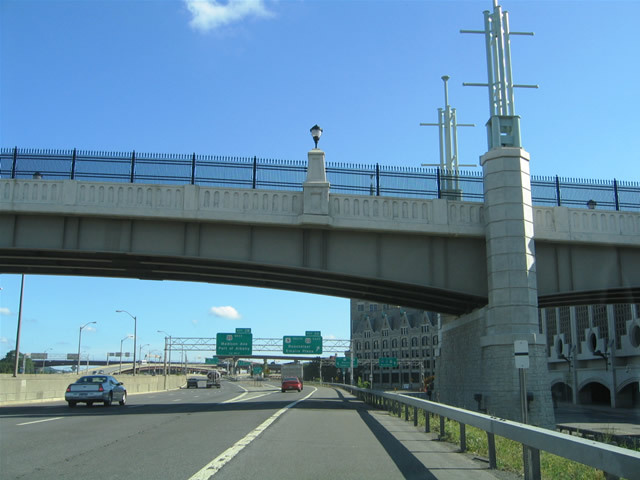 The South Mall Expressway northbound continues a short distance to the Empire State Plaza and ends abruptly at a tunnel system underneath the complex. The freeway was built as part of a larger unconstructed freeway between Interstate 90 Exit 8 and the unbuilt Mid - Crosstown Arterial freeway. Photo taken 06/28/05. Exit 3B departs Interstate 787 quickly beyond Exit 3A for Madison Avenue westbound. U.S. 20 follows the South Mall Expressway northward to Pearl Street (New York 32) and Pearl Street briefly to Madison Avenue. 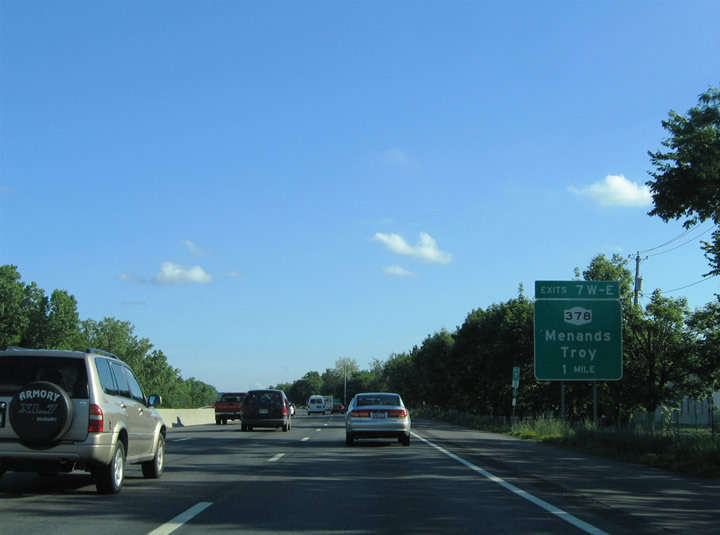 Interstate 787 southbound travelers can access the US highway directly from Madison Avenue three blocks east of New York 32. 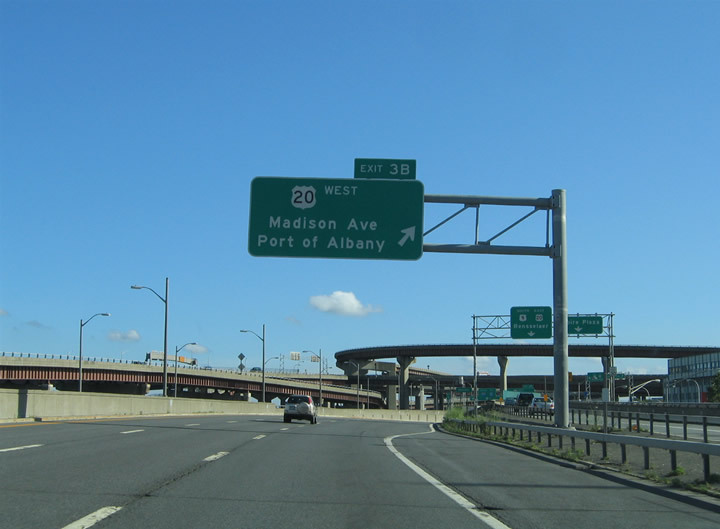 In addition to serving U.S. 20 west, Exit 3B also serves Broadway with its connections to the Port of Albany facilities. Photo taken 06/28/05. 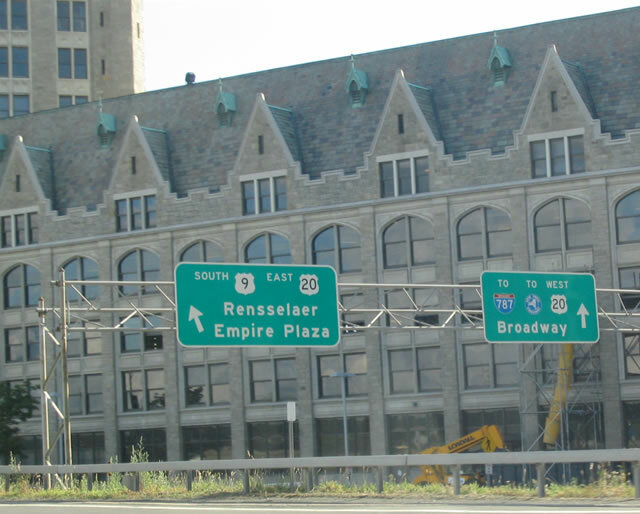 Exit 3A partitions into ramps for U.S. 9 south & 20 east to Rensselaer across the Dunn Memorial Bridge and the South Mall Expressway northbound to the Empire State Plaza complex. Photo taken 06/28/05. Sweeping direction ramps form a circle of flyovers high above Interstate 787 at Exit 3. 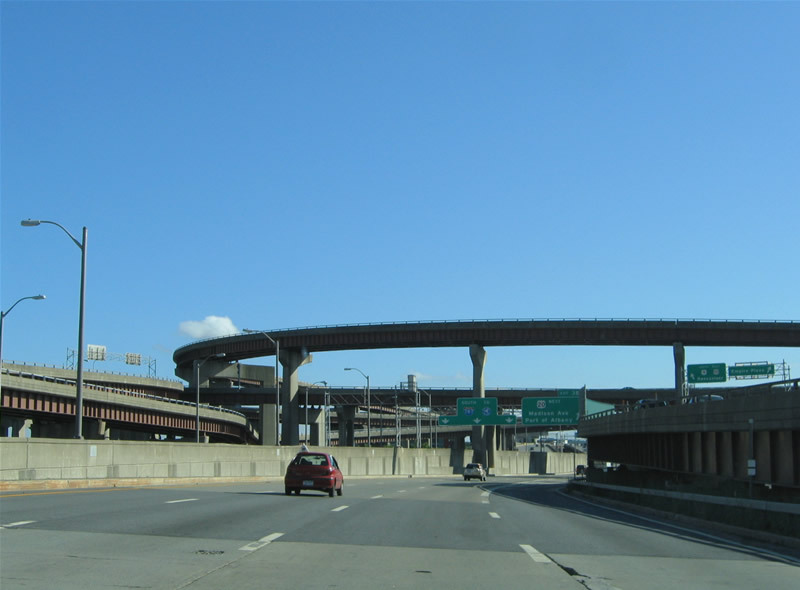 The circle stack interchange is a one of a kind with none other like it in New York state or the Northeast general. The set of bridges below the highest flyover carry the South Mall Expressway mainline. Photo taken 06/28/05. Interstate 787 southbound at the ramp departure of Exit 3B onto Madison Avenue westbound at Broadway. U.S. 20 follows Madison Avenue west to Western Avenue and Westmere. 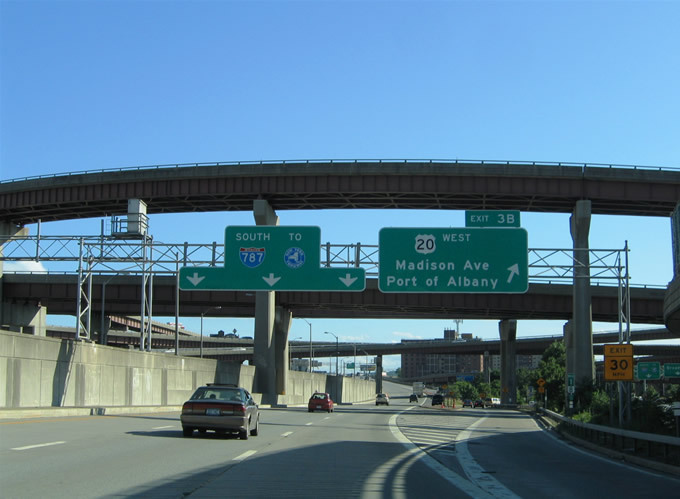 Broadway meanders through the circle stack interchange from the northwest, turning south along the Hudson River toward the Port of Albany. Photo taken 06/28/05. A view of the Empire State Plaza from Interstate 787 southbound from within the circle stack interchange. Empire State Plaza consists of a vast office complex for the New York State government that was built from 1963 to 1978. 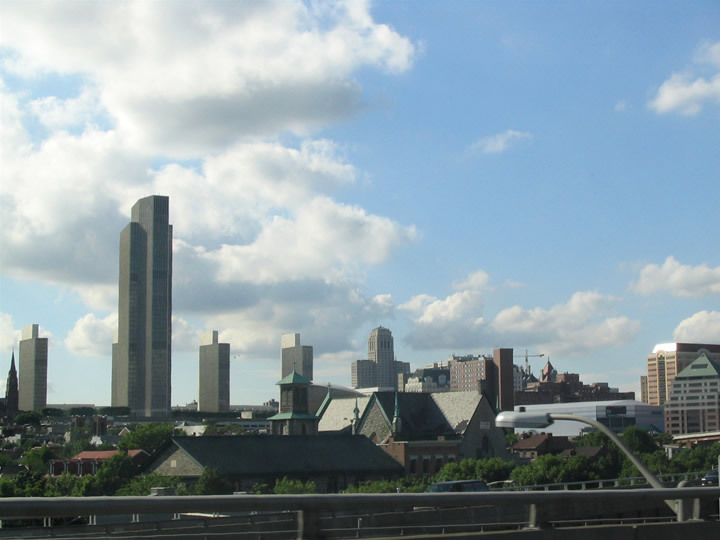 The tallest building in the complex, the Corning Tower, is the tallest building in the state outside of New York City. Photo taken 06/28/05. 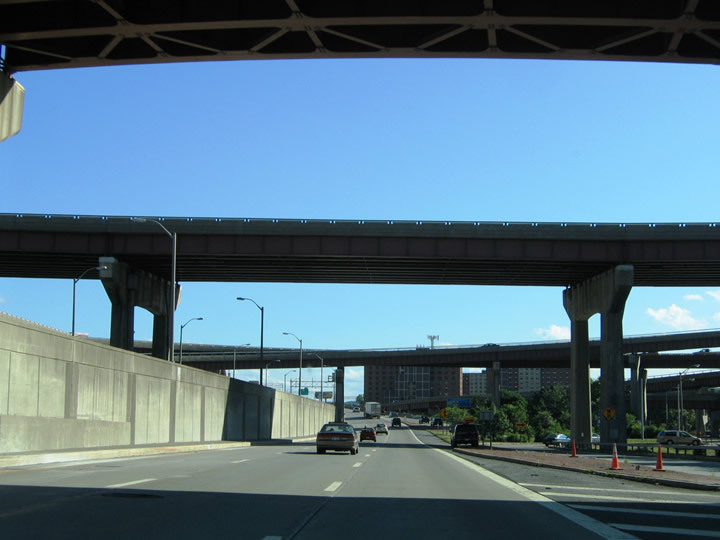 Passing underneath the South Mall Expressway on Interstate 787 southbound. Photo taken 06/28/05. 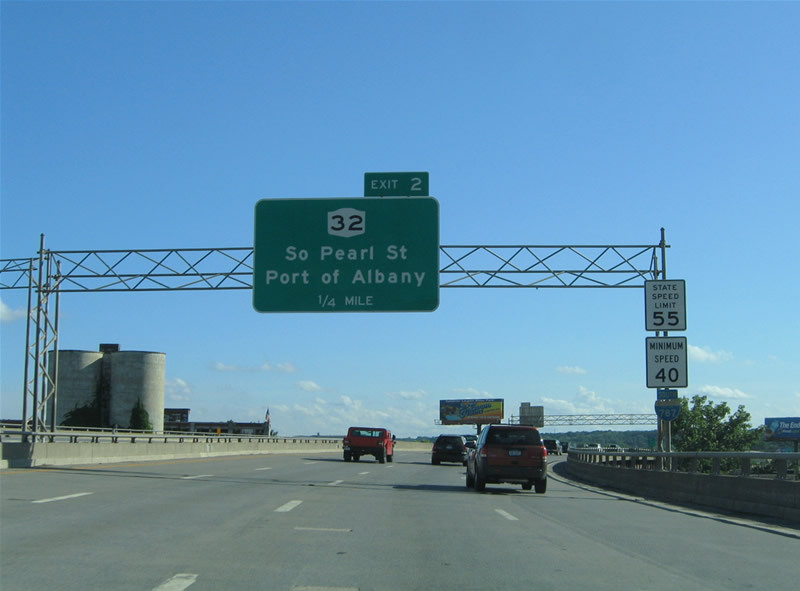 Advance signage for Exit 2 (New York 32), South Pearl Street, and the Port of Albany, the second largest port in the state. 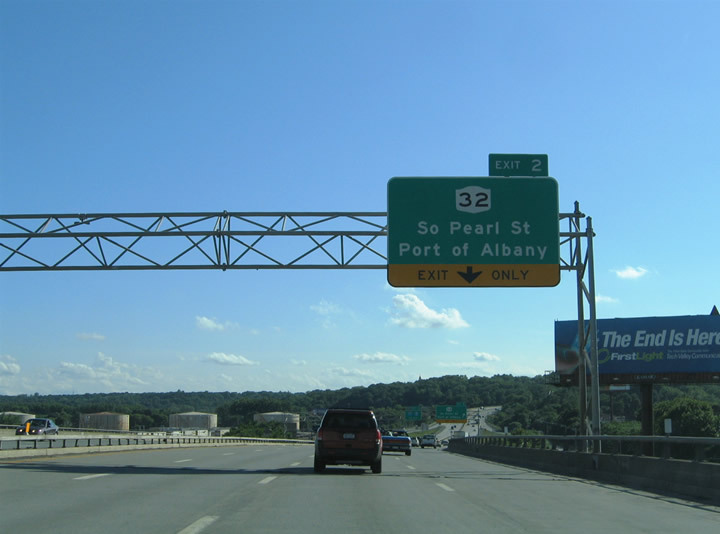 New York 32 follows Green Street south from downtown and splits between a one-way street couplet alongside of Interstate 787 at the Port of Albany. Photo taken 06/28/05. Drawing near the Exit 2 diamond interchange with New York 32 (Green Street) on Interstate 787 south. Slip ramps join the freeway mainline with the parallel Green Street. New York 32 turns onto Pearl Street beyond Exit 2 en route to Glenmont and the Port of Albany itself resides east of the freeway accessible via Broadway from Green Street. Photo taken 06/28/05. 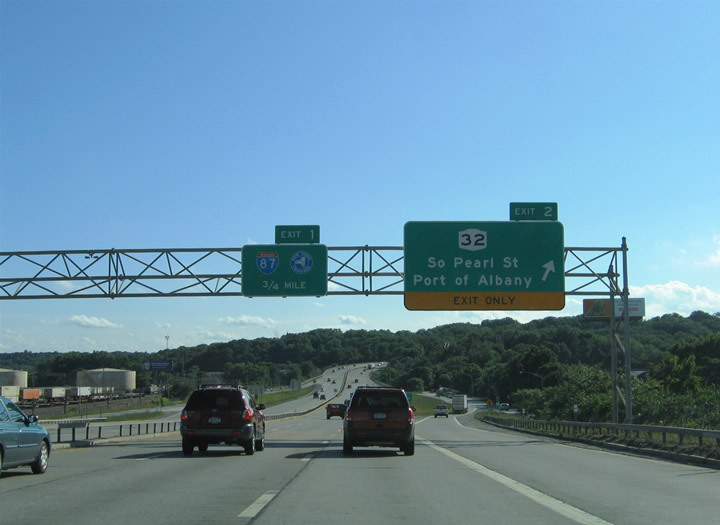 Interstate 787 southbound at the Exit 2 ramp departure to New York 32 (Green Street) to Pearl Street and the Port of Albany. 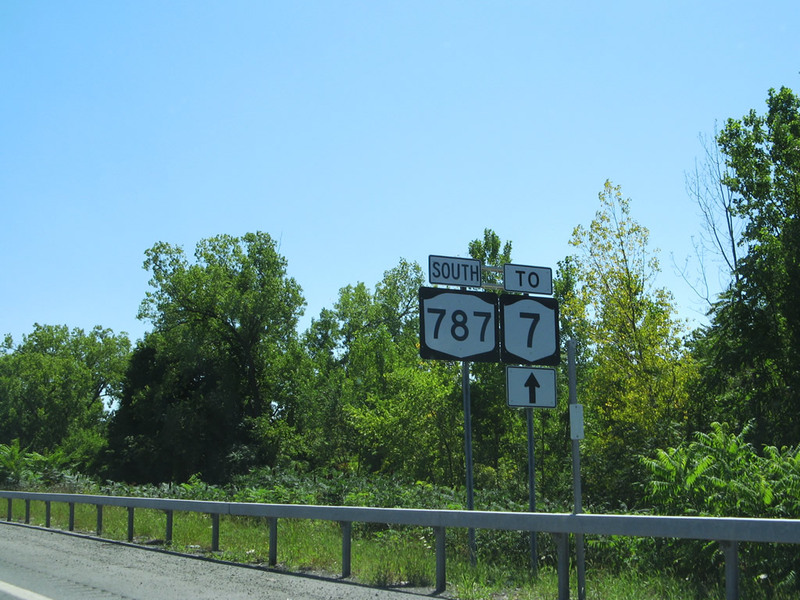 Interstates 787 meets Interstate 87 (New York Thruway) in one mile. Photo taken 06/28/05. The final southbound reassurance shield for Interstate 787 posted at the New York 32 (Green Street) under crossing. Photo taken 06/28/05. 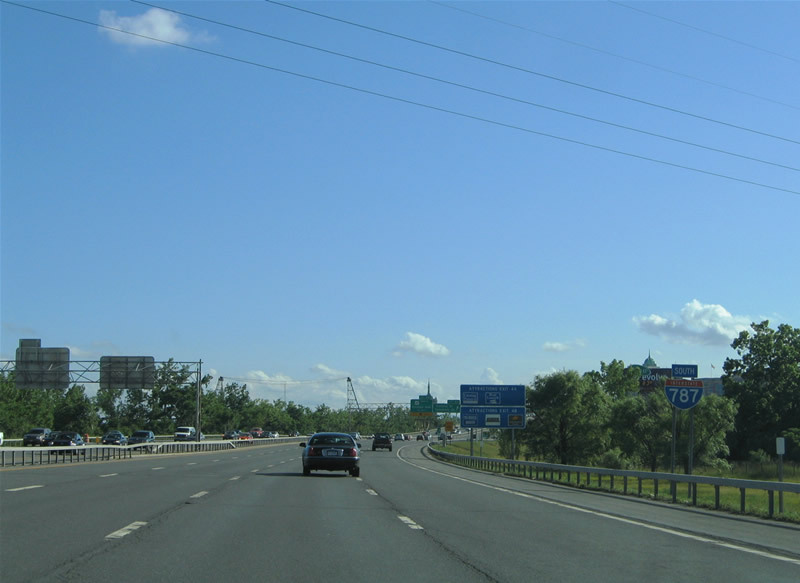 Interstate 787 partitions into two freeway prongs at its southern terminus. The first prong directly ties into U.S. 9W (Southern Boulevard). 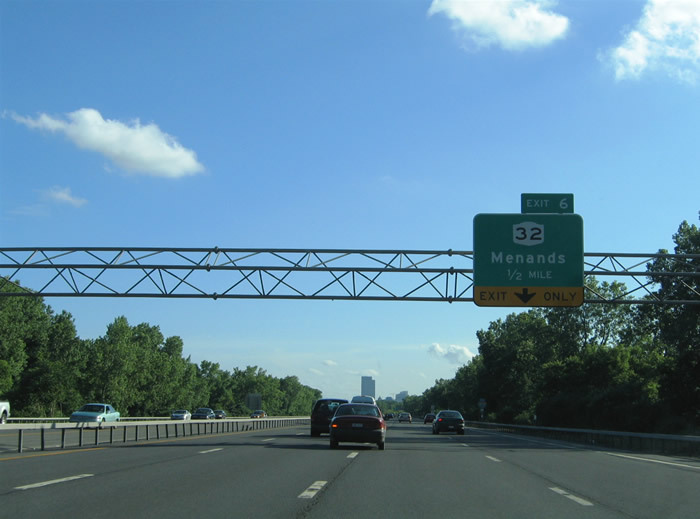 The second prong ends at the Exit 23 interchange of the New York Thruway mainline (Interstate 87). 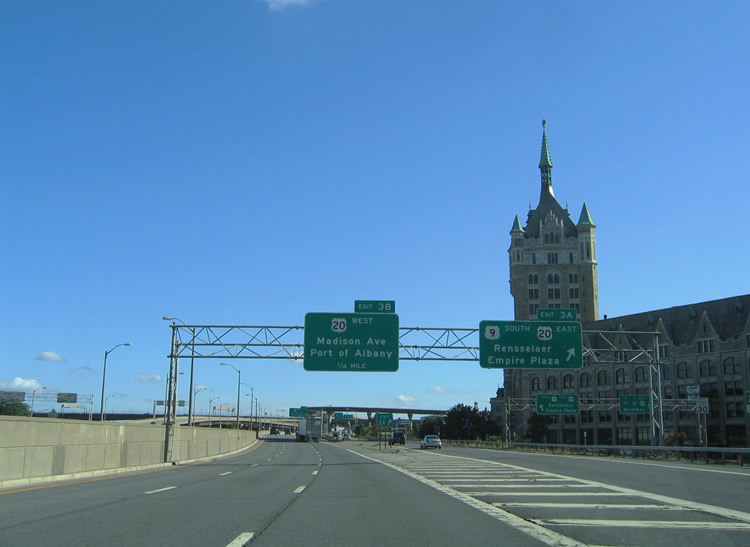 The control point for U.S. 9W of Albany would be better suited to display "Southern Boulevard" since Interstate 787 is still within the Albany city limits at this point. Photo taken 06/28/05. A wye interchange facilitates the movements of Interstate 787 to the New York Thruway mainline (Interstate 87). The freeway mainline otherwise defaults into an intersection with U.S. 9W (Southern Boulevard) in south Albany. 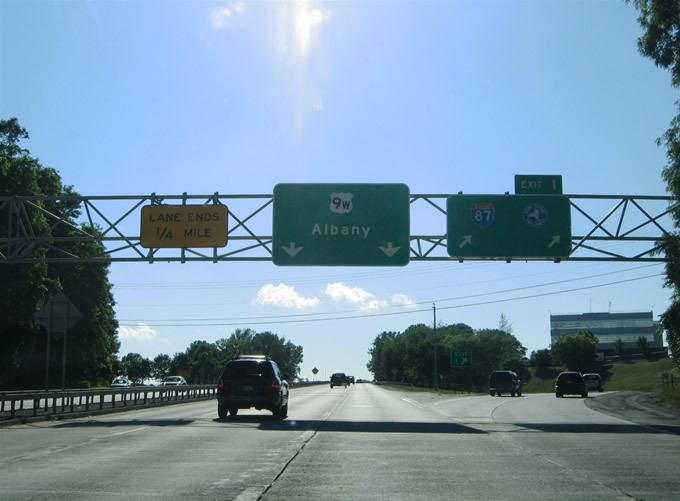 Interstate 87 bypasses Albany to the west between the Adirondack Northway at Interstate 90 (Exit 24) and Interstate 787 (Exit 23). Photo taken 06/28/05. Southbound at milepost 0 and the end of Interstate 787. 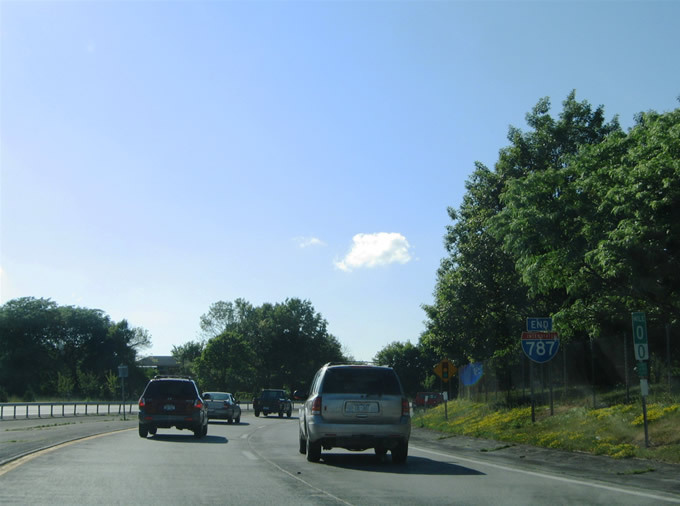 Originally this road was to continue onward parallel to the Thruway and morph into the Adirondack Northway, which is a reason the Northway comes to an abrupt end at U.S. 20 (Western Avenue). This was also planned to be the southern terminus of the cancelled Mid Crosstown Arterial. Photo taken 06/28/05. Page Updated September 1, 2009.